Some members of the UK government seem to understand that renewable energy is the way forward for Britain. Deputy Prime Minister Nick Clegg recently launched a plan to boost offshore wind energy and develop a home-grown industry, creating “26,000 jobs and a £7bn a year business by 2020”. But this ambitious plan is in danger of being thwarted by the government itself, in its reluctance to support EU targets for renewable energy beyond the current targets for 2020. 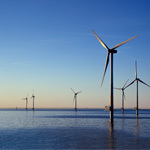 Renewable energy companies do not know what the regime will be in the future, and are thus becoming reluctant to invest. “Firms such as Vestas, Alstom, Siemens and General Electric have all scrapped plans for new wind turbine factories in Britain, or put them on hold, because of uncertainty about the government’s commitment to clean energy,” said Tom Greatrex, Labour’s Shadow Energy Minister. In order to maintain growth in the wind and renewable energy industry, provide new jobs and export opportunities and honour climate change mitigation promises , it is essential that the UK along with the other EU Member States support binding 2030 targets for renewable energy and greenhouse gas emissions.